A good portion of my wardrobe this season is from Talbots. 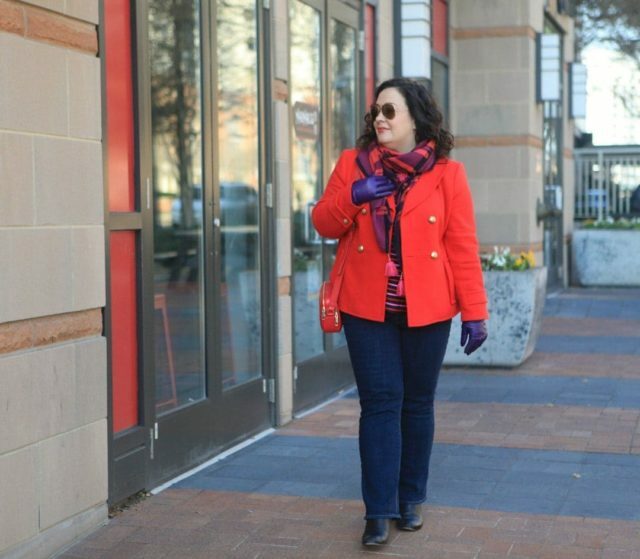 Recently I featured a formal look from Talbots, today it’s much more casual. However, both looks have in common Talbots’ famous modern classic style. If you know me in person, you know I have been wearing this peacoat nonstop. The details make this jacket a standout – the herringbone weave, the structural seaming, the waist seam that nips in, the gold crested buttons… this is the kind of jacket that stops strangers to compliment and ask where you got it. It comes in three colors, regular, petite, woman, and woman petite. 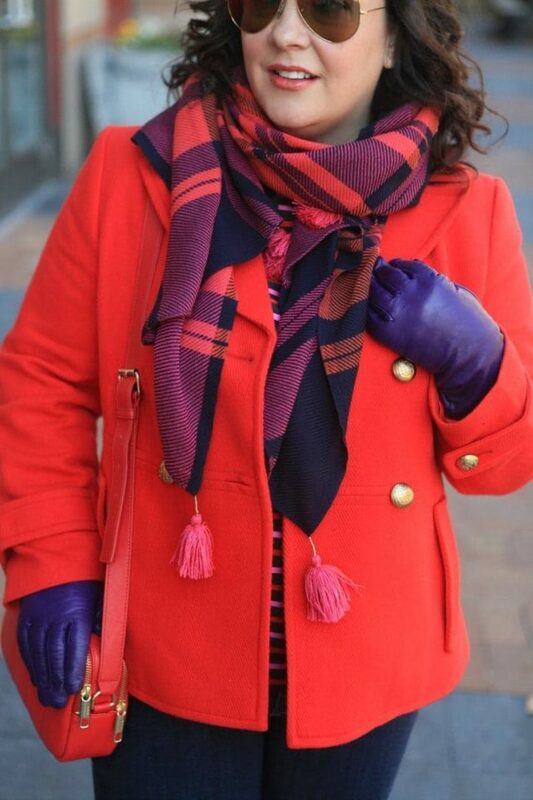 I’m partial to red, which is the hot color for the season. 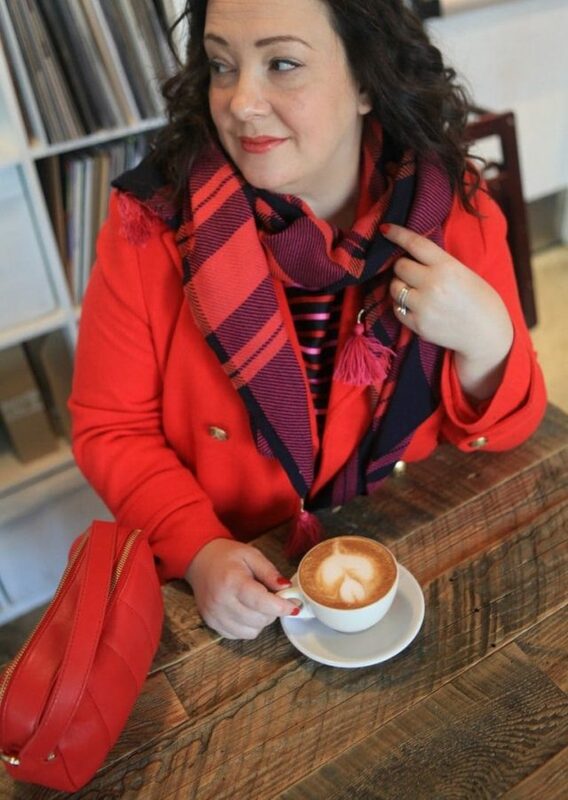 When I saw this scarf in my local Talbots store I knew I had to have it – the blend of colors and the fun tassels make it stand out and the wool is soft against my skin. 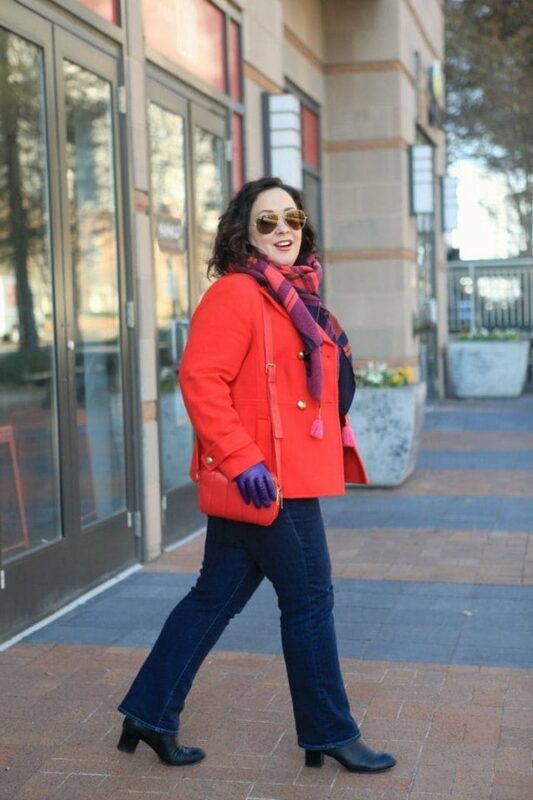 I decided to pick up the purple tones of the scarf with purple leather gloves – these gloves from Talbots come in six different colors and have touch-finger technology so you don’t have to take them off to answer your phone (what a great gift idea!). Continuing with the red theme is this leather bag. It comes in five different colors and is brilliantly designed. Two separate zipper compartments, each compartment having additional pockets, and the strap easily switches from shoulder length to crossbody. Oh, and it’s on sale! This top is a favorite this season. 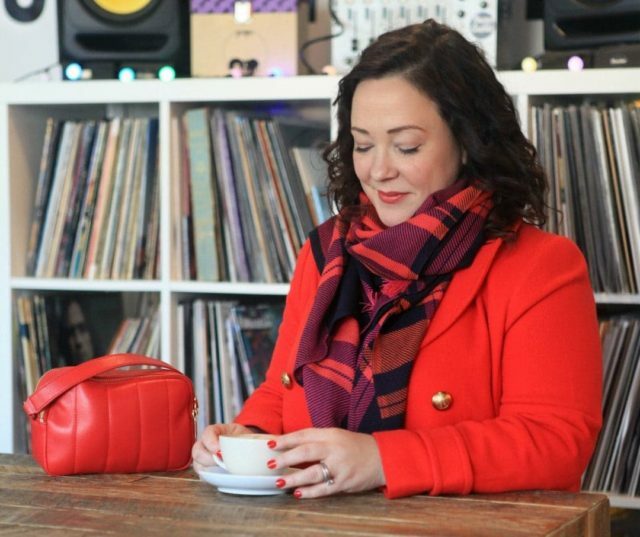 While I have it styled with jeans today, it looks equally lovely tucked into a velvet skirt, styled with a cocktail pantsuit, or with work trousers for the office. This was a perfect look to check out a new coffee shop with my husband (and yes the cappuccino was delicious!). Thank you Talbots for partnering with me again. 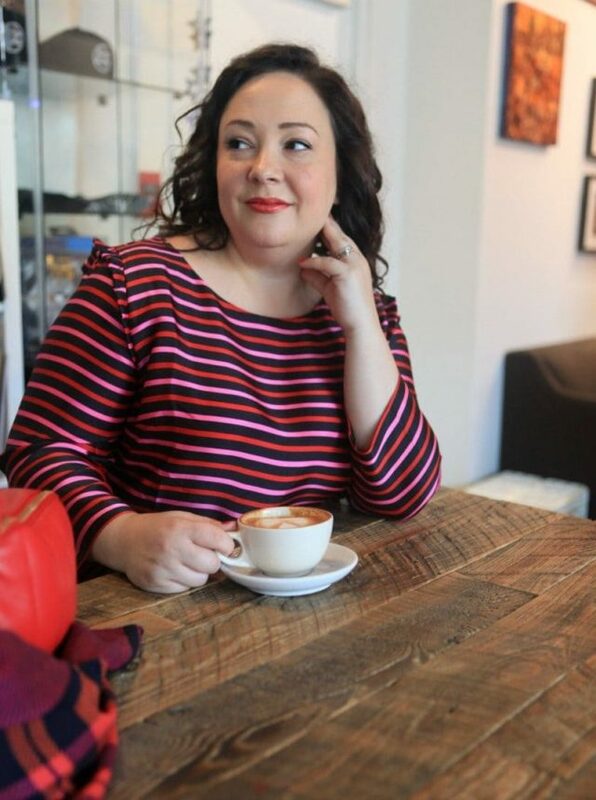 I love featuring your clothes because they are classic yet stylish, high quality, and come in such a great variety of sizes! This is a perfect sponsored post, IMO. You look great, and everything fits your style so well that I have no trouble believing you’d wear this outfit and blog about it even if you didn’t get paid to do it. Thank you so much Angie! I’ve been pretty picky with the brands I am partnering with, and it’s been nice that they’re giving me a lot of creative freedom and freedom to choose the clothing. 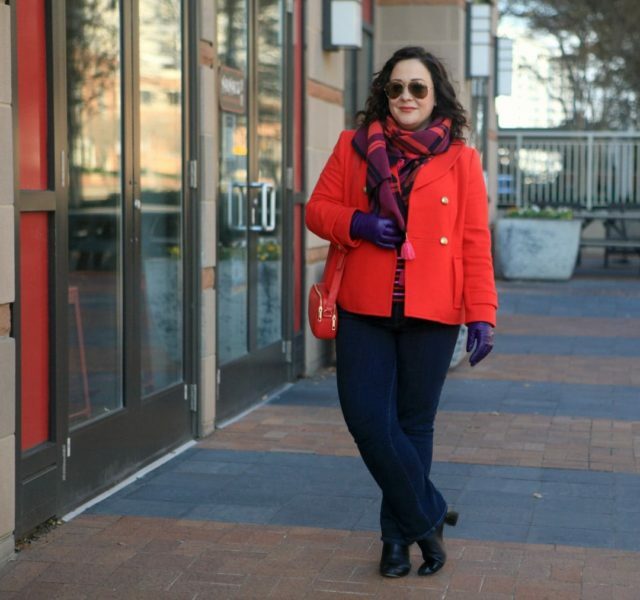 I already owned these jeans, I’ve worn this top half a dozen times and even took it with me to Texas this past weekend, and this peacoat is on constant rotation! Love the whole look! I’m always amazed at Talbots’ quality. I have a ton of pieces that are over 5 years old, and are still in style and are in great shape! Their classic styles and the fact that they carry petites are a big win for me. I happen to like the Friendship Heights store in the DC area. Oooh I haven’t been to that location in a long while. I’ll have to check it out! Fantastic look, rich colors and you wear it all so very well. Enjoy your Holidays! I love the colours and excellent accessorising choices. Gorgeous! Fabulous outfit. You look great! You look great! I admire your style and how you look so effortlessly put together. Which is your favorite Talbots location in the DC area? I love the Tyson’s store, but miss the White Flint location…. Thank you! It’s a tie between Tyson’s and Annapolis. Tyson’s is huge and has a great staff, Annapolis isn’t usually too busy so it’s easy to get personal service! I love this look. Very classic. My mother and I shop at Talbots too. It really is a great place for “never go out of style” pieces. Allie, I don’t know how you did it (actually I did- it’s your skill) but you took the boring out of classic! This outfit is so flattering! The colors suit you brilliantly! Can you share your lip color? It is perfection! Merry Christmas!